Stumbling through shooting galleries, trains, secret societies, and falling houses Buster Keaton delivers outrageous stunts and antics (all with the famous deadpan delivery that earned him the nickname “The Great Stone Face”) in a program ofclassic comedic shorts. Enjoy these films along with Brendan Cooney’s fresh new original scores, complementing the films with a classic 1920’s urban-Americana soundscape, combining many strands of American roots music. 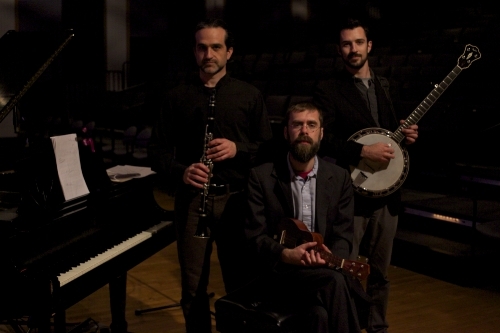 Ragtime and old-time meet the blues, bluegrass and hot jazz, played live by a talented trio of musicians. Brendan Cooney-Piano Brendan recently moved to Boston from Philadelphia where he played piano in the Rhinoceri Trio, and baritone horn in the legendary West Philadelphia Orchestra. He has composed scores for numerous silent films under his Not-So-Silent-Cinema project. Martha Hyde– clarinet. Martha is a woodwind player from New York City who appears regularly in Broadway pits and at Radio City Music Hall. She has performed with such luminaries as Dizzy Gillespie, Antonio Banderas, Whoopi Goldberg and Vanessa Williams. She is on several Broadway and Off-Broadway cast albums as well as three recordings with the Gotham Wind Symphony. Her compositions span the styles of American jazz and classical and Appalachian music. Lisa Liske-Doorandish– cello. Lisa lives in the mountains of southwest Virginia, where she is presently preparing an eclectic CD of solo cello music, reflecting her interest in old, new, and world music. She performs as a soloist and chamber musician throughout the south. With her Community Cello Works teaching studio Lisa is a much sought-after teacher. Her book on cello technique and her book of repertoire for beginner cellists will soon be available.